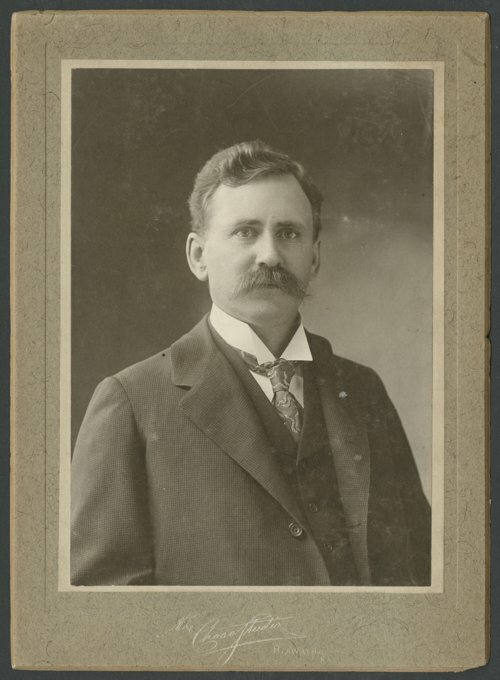 This cabinet card shows William Foster Means (1861-1930), a lawyer from Hiawatha, Kansas. Means, a native of DeKalb County, Missouri, graduated from the University of Missouri in 1885 with a degree in law and was admitted to the bar in 1887. He promptly moved to Horton, Kansas, in 1887 to practice civil law. Considered a conservative and thoroughly educated attorney by his peers, Means was elected county attorney of Brown County in the fall of 1890. Upon assuming the office he moved to Hiawatha, Kansas. Means was re-elected in 1894 and in 1900 respectively as county attorney. He did not seek re-election in 1904 but returned to private life. Actively involved in the community, Means held a number of elected and appointed positions from city attorney of Hiawatha to serving on the local school board. In addition to these positions, he was a member of the Republican party and one of the founders of the Citizen's Bank of Hiawatha. He also served as a member of the Ancient Free and Accepted Masons and the Independent Order of Odd Fellows.